The goal with scripting is that you feel good about a subject you want to shift. If you can feel good about it for a while, even just 10 minutes a day, things will improve for you no matter how much it doesn't feel good when you are not scripting. Feeling good is wonderful. If you can... shoot for feeling fantastic. If that is too much of a stretch just aim for feeling some relief. With scripting you write about the future as if it is happening right now. I like to start with where I am sitting and take it from there. "I am sitting here enjoying the water rock the boat. My kids are asleep and so is my husband. The captain is busy doing his captain stuff and I am left here at the bow to watch the sun glint off the water and write. I feel so at peace. My kids get along so well. They are such a great team. I love to watch them interact...."
I went on like this for a page. That afternoon while the kids and I were hanging out my 16 month old started tickling and kissing her sister. She has always been affectionate but this was something new! It suddenly occurred to me, "I just wrote about this in my script! I just wrote that my kids get along so well and that I love to watch them and it's happening already!" If you are not used to writing, or if you have been feeling depressed or angry for a long time then scripting might feel like a stretch. Your script might sound more like "I am laying on the couch and for once I don't feel like screaming. It's nice to just lay here and not have my eye twitch." Be honest with how you feel. Law of Attraction tools are all about aligning what you REALLY feel with what you REALLY want. So when you script, the whole point is that you feel better (or great, or "YAY!" or simply relief) when you write it. Should I Write Every Day? That's up to you. If it feels like work and you start to dread it, no. It's supposed to be helpful, not a burden. But if you like the tool or you can at least get to a better-feeling place by the end of a page, try it once a day for a month and see how much better you feel. Law of Attraction tools work if you apply them consistently. Can I Talk About More Than One Thing? You can talk about whatever you want in your script. If I am working on a particular subject like attracting more email readings, I will write one whole page on how great it feels to do email readings for clients who are in alignment with my work. If I am just using the tool to continue "allowing" my life I will write about my life in general and how great it feels to be living it. But imagine that you have an issue that is bugging you. Like YOU want more clients. What do you think might shift if you did that every day for one month? Or two? I know a Law of Attraction coach who built her budding practice using the scripting tool. She filled up with clients within three months. Remember that the point of scripting is that you are writing about something you want AS IF it has happened. And that you feel good while you write it. Scripting is one of the Law of Attraction tools that you can take anywhere - because all you need is a piece of paper or a computer. Get The Scripting Book Oprah Asked About! If you are drawn to scripting and you want to truly master it, I have a recommendation for you. My favorite Law of Attraction coach, Jeannette Maw, created an e-book that answers every single question you can possibly have about scripting including "am I doing this right"? She gives examples, true-life stories and motivational tips that will help you overcome any blocks and self-sabotaging resistance you have for finally sitting down and writing. Does it work? 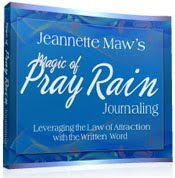 Well...Jeannette used her own Pray Rain Journal to manifest being on Oprah - and it worked! How cool is that?! I have my own copy and I personally recommend it. Oh yes! You can use any language you like. The magic of scripting is that you focus on something positive for an extended period of time and because you writing it down you find out what you truly feel positive about and not what you think you should like or what you liked in the past.